Located in the heart of the Miyazaki Prefecture you’ll find the small capital city Miyazaki. This southeastern coastal city is known for its relaxed slower pace of life, warm weather, and warm people. 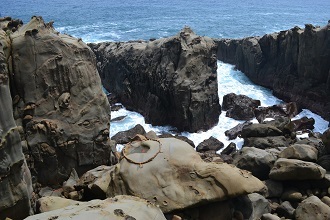 Miyazaki has numerous opportunities for outdoor adventures from the beach to the forest. Miyazaki Seaside Park and Aoshima Beach offer something for every water enthusiast like swimming, surfing, and even sailing. Those looking for a good day trip outside of the city can venture north to Takachiho. This picturesque town is immersed in Japanese mythology and is known to be a very powerful and spiritual spot. Here you can enjoy a boat ride through the gorge, walk the trail to a waterfall, or visit the tucked away Takachiho Shrine surrounded by trees. Also located just outside Miyazaki city is Aya Town, Japan’s largest evergreen forest. There is no better way to view the extensive forest than by crossing the pedestrian suspension bridge! Another beautiful destination is the seaside Udo Shrine, which sits in a cave overlooking the ocean. Those visiting Udo Shrine are able to walk along a terrace outside the cave. On the rocks below is a target, which you can try to throw small ceramic balls at for good luck! Last but not least, wind down and enjoy Miyazaki’s “egg of the sun”, mangos! What do you like about teaching in Japan? My students are the best part of my job. They make it so easy to care about how I perform and I always want to give them the best lesson I can. Classes are a great opportunity to learn about my students and I love to hear their perspectives and opinions and about their lives. But also, my coworkers have been unbelievably helpful with everything, work and personal. They`re my North Star! My compass! My vacations are usually spent traveling. So far, I`ve been to Tokyo and Kyoto. This summer, I`m going to Hawaii. And, I`m planning an Okinawa trip in fall. I spent Golden Week with my friends in Tokyo. They flew from Los Angeles and we explored and ate as much Japanese food as we could. To get away from the city for a couple of days, we took the Shinkansen to Kyoto and wandered temples and paths cut through bamboo forest. We also went to Gion, searching for Geishas in training and ate fresh Unagi by the river. It was something.